We went to Grand Designs Live last month looking for new and innovative products to share with you. We have reviewed various building products, (you can find information on clay plaster and an article about Roto Roof Windows in earlier blogs) but this one is more decorative, we think you will agree that these Jellyfish Capsules would certainly make a statement in your home. So we want to share our findings with you including 5 facts about Jellyfish that you should know if you are thinking of getting a jellyfish tank. Number 1. Did you know that jellyfish can’t swim? 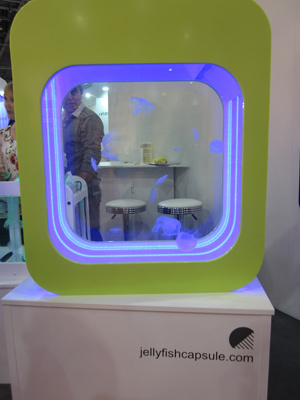 I found out so much about jellyfish when I visited Excel in London, for Grand Designs Live. 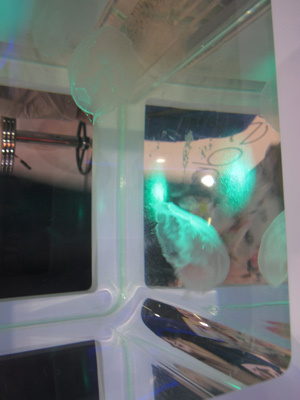 One of the first things I saw was a beautiful Jellyfish Capsule which was understandably mobbed by visitors to the stand. The Capsules are the design baby of Daniel Hoskins who has a degree in special effects, and works on production and film sets when he is not making tanks. He was launching his product at Grand Designs Live and was really happy with the response. Some species of Jellyfish are ideal as pets because they don’t sting. Daniel Supplies non-stinging Moon Jellyfish with his tanks because they do not have a sting and they are relatively small, so you can get more of them in a tank at a time. The movement of the jellyfish is soothing and tranquil, but it is a feeding action, not a swimming action, Daniel explained that they cannot swim and rely on currents in sea water to keep moving in the wild, so he had to install a system that keeps a constant cycle of water flowing through his tanks. He realised that if you try to keep jellyfish in conventional tanks they tend to get stuck in the corners and die, which is why Daniel designed his Capsules with curved edges, which also make them a beautiful piece of design. He sells Jellyfish Food which is frozen brine shrimp enhanced with extra vitamins to keep them healthy. The Jellyfish live for 3-12 months in captivity and they may produce young in that time. If not it is a quick and simple process to order more from Capsule. Moon jellyfish don’t need light to thrive, this means that you can site your jellyfish aquarium anywhere you want in your home. The Moon Jellyfish are illuminated by Capsule’s innovative lighting system, and they glow and pulsate in the light. The Capsule houses a LED lighting system which allows you to mix and transform light into millions of colours to suit your mood, and is easily controlled by an app from your phone. This makes the jellyfish tank into an amazing mood lamp aquarium. Daniel showed me the filtration system and explained how simple they are to clean and maintain. Of course I was intrigued about delivery of the inhabitants and apparently they arrive in the post once you are ready for them. They are specially packaged to ensure they arrive safe and healthy. The Capsule cases can be customised in a range of high lacquer colours, and there are table top and self standing designs available. I could have stayed by his stand watching the jellyfish all day, but I had other people to meet so I tore myself away, but I am already planning where I can fit one into my interior design makeover. The Capsule website is cool and easy to navigate, and has pictures of the various Capsules plus further information about the jellyfish. There is an online brochure with pricing and more pictures of these beautiful creatures and the stylish homes Daniel has build for them. Visit the Capsule website for more information on Capsule styles and prices, and on the Jellyfish they supply.